Free Shipping Included! 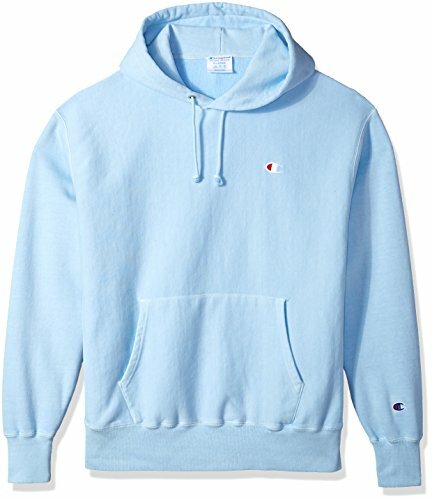 Champion LIFE Men's Reverse Weave Pullover Hoodie, Upstate Blue Pigment Dyed, XS by Champion LIFE at Toad Lily Press. MPN: S2316-I2S-XS. Hurry! Limited time offer. Offer valid only while supplies last. Your favorite sweatshirt kicks it up a notch. The Reverse Weave pullover in this Champion top gives you soft classic comfort but without the bulk. Your favorite sweatshirt kicks it up a notch. The Reverse Weave pullover in this Champion top gives you soft classic comfort but without the bulk. Featuring a soft brushed interior with wider ribbing at cuffs and hem, this longer line for improved coverage will be your favorite gear for everyday wear and comfort. Embroidered logo at chest and cuff - Heavyweight 12 oz. fleece with a brushed interior for extra softness. Two-ply self hood with drawcord and kanga pocket for warmth -Two-ply self hood with drawcord and kanga pocket for warmth.